← Welcome … “Miss Andrea”! 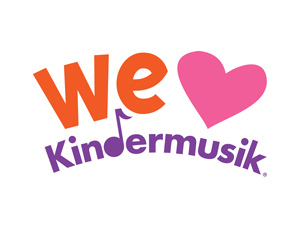 There’s no denying it … We Love Kindermusik and we know you do, too! #1. Show your love for Kindermusik and “tell” us about it here on our blog. Post a comment about why you love Kindermusik and you’ll be entered in a drawing for a FREE 5-week summer session of Kindermusik (an $85 value). #2. Then go to our “Kindermusik with Carol Anne Friesen” facebook page http://tinyurl.com/8ye7hgd and click “like”. That will give you 2 more entries in our drawing. Already liked us? then you’ve already got 2 entries! #3. Be sure to have your child wear their red Kindermusik t-shirt to class the week of February 13 – 18. Don’t have a Kindermusik t-shirt? Purchase one in class this week. Cost is just $7 and all the proceeds will go to our classroom painting project. We joined kindermusik when my son was 3 1/2 months old. In a little over a year, both mommy and E have met wonderful friends. The village class has enabled E to learn & play in an environment surrounded by children of similar ages. The 45 minute class is a great place to bond with your child, while the” stay & play cafe” provides an independent play environment for kids and a place for mommies to connect. Thank you to Carol Anne and her staff for facilitating our journey into the wonderful world of parenting. You could say I am biased because I am a Kindermusik instructor or you could say that I am one of its’ biggest fans which is why I started teaching. My 1 and 3 year old girls have always loved music but the connection they made with the Kindermusik music and the learning that took place in class won me over last spring. Being interested in child development, the thing that stood out to me most, aside from my daughters’ obvious joy, was that the entire program is based on the latest developmental research and that many of those facts are taught to parents during class. I love that Kindermusik’s goal is to develop the “whole child” and does so in so mnay ways. I also LOVE Miss Carol Anne’s unique Stay and Play Cafe and have really enjoyed getting to know the community of moms that participate with their little ones! Kindermusik has been a constant in our lives for over a year, and is so much more than a music class. It is heartwarming to see my son excited for class and also to sing the songs and do the activities from class at home. Often times Kindermusik songs provide the soundtrack to our lives – from CDs in the car, to class songs at the changing table, to the ever important “clean-up” song – which my husband even sings! The environment has also provided a unique and much needed opportunity to connect with other moms to learn from and share with each other. My son and I have both enjoyed and benefited immensely from this class! My son and my mother started Kindermusik almost two years ago. It has been amazing watching his love of music grow. I love to attend as well when I have the chance and I am so thankful for the bonding time and all the special mommy friends I’ve made too! We are very excited every Wednesday to join Kindermusik. The children LOVE it! And I am very happy to have my 2,5 year old and my 4,5 year old in the same program, that is GREAT! My daughter and I started Kindermusik over a year and a half ago. It has been a blessing not only for her, but for me as well. Kindermusik has allowed me to meet new mommies and make some wonderful friends. I love watching Z’s expressions when she figures out something new or playing with her friends in the Stay and Play Cafe. Thank you to all the wonderful staff who has helped my daughter to grow in all directions. I love seeing the expression on Logan’s face when I tell him it’s time to go to music class or when we are at kindermusik, the expression of total enjoyment. After trying different sports and activities with him and having him not be very interested and not wanting to do them again, I know he loves his kindermusik because he gets excited before every class and talks about it for hours afterwards. I love kindermusik because it gives me a chance to spend an hour with Logan doing something he loves! It’s been almost a year since my 3-year-old and I were in your Kindermusik classes, but we STILL sing the songs everywhere–during meals, in the car, while rocking the baby to sleep! And my daughter asks me to “read” the parents’ guides to her almost every night before bed. We do the actions we learned in class and sing the songs. I can’t wait to join a class again . . . now this time with two little ones! Even though I’m not able to take Riley to the Kindermusik classes myself, I know she’s having fun, learning and bonding with her nanny, Anna. Whenever I bring out the take home books and cds and start singing she smiles and looks at me like, “You know these songs??”. I’m so thankful for Carol Anne and the love she has for children. My daughter Gianna and I love Thursday mornings at Kindermusik! Each morning Gianna asks to listen to her Kindermusik CD while eating breakfast. What a great way to start the day!! We especially love “jingle jingle jingle go the car keys”. Gianna laughs out loud with one of her belly laughs! Thank you Miss Janice and Miss Carol Anne for this wonderful experience. We have just started going to Kindermusik as well, but we already look forward to going every week! At just 6 months old, my little one gets so excited in class and I love seeing her learning and experiencing new sounds, motions, & music. I also love that she gets a chance to interact with other little ones and I get to chat with other mommies! We love Kindermusik for so many reasons. It’s a great time for bonding with your child, and developing friendships with other children and parents. We have just begun our journey into Kindermusik! I bring 2 of our 3 children and they enjoy it! At home when we listen to the CD from class my oldest now keeps asking when she can go along. 🙂 I love the fact that it does pull us away for an hour each week and focus on our little ones! Having fun, dancing, singing, and learning! I love Kindermusik because it allows me to share music with my son — something that is very special to me, being a music educator. It is so important to have music in one’s life and Kindermusik is a wonderful way to build a lifelong love of music. I love Kindermusik because it is dedicated time every week to laugh, dance, sing and snuggle with my babies. I can focus entirely on them and watch as they explore instruments, interact and just plain have fun. I also love swapping stories and suggestions with other moms after classes. I wasn’t sure what I was getting myself and L into when he was just 2 months old, but, Kindermusik has been such an instrumental part in his growing and learning, that I could not imagine life without class. Now at almost 14 months, L starts swaying when he hears music and loves the friendships that he has made at such an early age. Words can’t thank you enough, Carol Anne! We both love Kindermusik! There are so many reasons: watching the joy on my child’s face and seeing her learning evolve; connecting with other moms; and having that special time with her to bond. I’m very grateful for the wonderful teachers and overall opportunity. Thank you! My children both love Kindermusik! We have been coming since August of 2011 when Miss Arissa invited us to try it. We will continue to come until they are too old! Thank you Miss Janice, Miss Andrea, and Miss Carol Anne for your hard work and dedication to enriching the lives of children in Palmyra! Kindermusik class is my favorite hour of the whole week, because even though we sing and dance at home, I can totally focus on my little one without having the distractions of laundry, clutter, or the phone. I also love that the curriculum is based on brain research and the music is so diverse!! I love that we are both supported in our growing: E as she develops and me as her parent!